Here we are back in my kitchen.Do you have everything you need? Millk? Brushes? Food coloring? Toaster? Bread? I used wheat bread this time. For the optimum Painted Bread color contrast, white bread works best. Oooo...those bright colors against that milk-toast white is breath-taking! 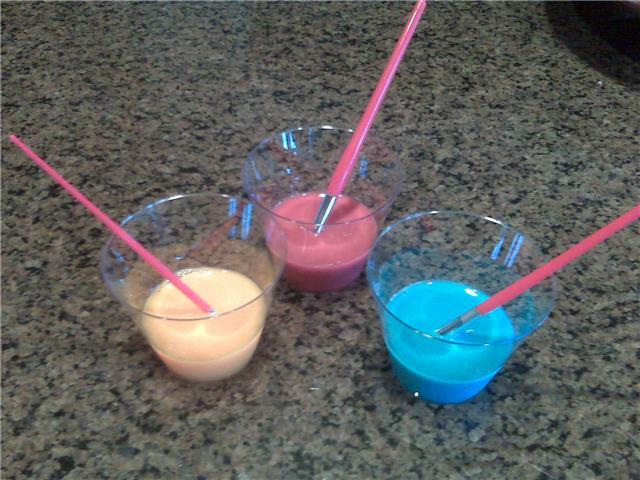 Go ahead and put around 7 or 8 drops of food coloring in each glass of milk. Remember we're using red, yellow, and blue. (Those are pretty special colors with their own important name...primary colors.) Stir the food coloring in the milk using your super clean brushes. Now we're ready to really have some simple fun. Paint your bread. Go ahead. Do it. Fill those bristles with lots of paint and spread it right on your bread. Use all the colors. Make rainbows, or cars, or hearts, or your name, or anything you'd like. Have a blast! I must caution you to avoid the urge to saturate your bread with the paint. Soggy bread falls apart in the toaster. Trust me. I have had first hand experience in crummy things like this. I bordered the crust with red.Now put your bread in the toaster. Wait for it to toast. (The waiting is the hardest part.) Pop! Out it comes! Awesome! Go ahead and spread some butter or maybe a bit of peanut butter on it and you have a delicious simple feast, my friend. What do you think about Painted Bread? Post a comment. Tell me. I'd simply love to know. This activity is fun, fun, fun and super easy to do! Gather up the following items and have them ready tomorrow morning. You just might like to make Painted Bread for breakfast! Yum. That's it! See you tomorrow.